This morning we visited the National Museum of Natural History in Washington, which is administered by the Smithsonian Institute. I had read in advance that in this museum there is exhibited the famous Hope Diamond, one of the most reknowned gemstones in the world. 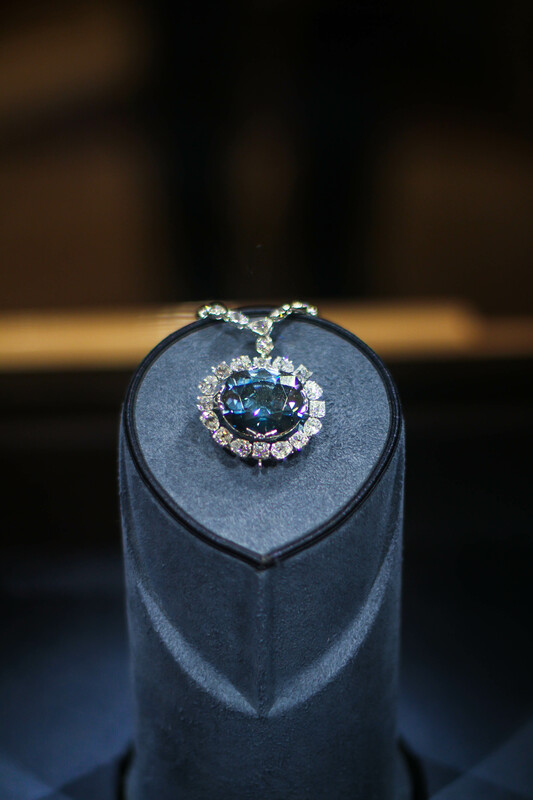 This stone, originally mined in India, weighs in at 45.52 carats, and is a flawless, rare deep blue diamond. It’s surrounded by 16 white diamonds and is suspended from a platinum chain that is set with a further 46 diamonds. It is reportedly worth around $200-$250 million. The diamond has an amazing history, and is surrounded by mythology of a supposed curse which brings misfortune and tragedy to any owner. It sits in a case in the middle of a gallery in the museum, rotating round on a pedestal, sparkling and glistening under the lights. Perfect to represent ‘blue’ for today’s challenge. This photograph was taken at around 11 in the morning in a gallery with no natural light. I obviously did not want to use any kind of flash as it would just reflect off the glass case and ruin the picture. I also had the problem of the lights sometimes shining off of one of the facets, which effectively blew out the image, so I experimented a little with my camera angles, whilst trying to keep the main diamond in the center of the picture. My ISO was set at 320, aperture at f/1.4, and shutter speed 1/125. Post-processing in Lightroom, I initially wanted to remove the yellow cast that the artificial lighting had given to the picture, so I decreased the temperature. I increased the contrast, clarity, vibrancy, saturation, and sharpening. I decreased the highlights slightly, and finally increased the saturation of just the blues. I couldn’t resist this Smurf float for today’s challenge of ‘blue”. 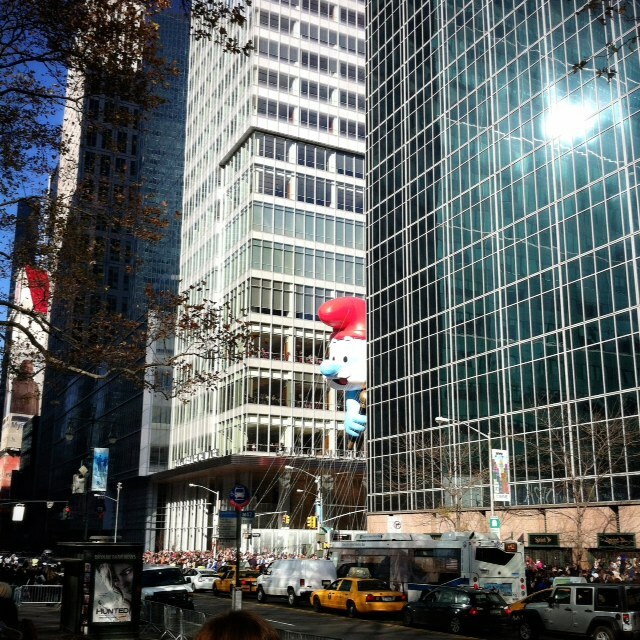 Blogging from NYC, this was taken at the Macy’s Thanksgiving Day Parade earlier this morning. I had originally thought I would be posting a photo from Tiffany’s Christmas windows, but this guy was so darn cute, how could I resist? It was taken at about 10:00 am in sunny skies and edited on the run in snapseed. Cropped to a square, auto corrected for color and contrast and then sharpened. Oh wow…..now that’s a gem! I don’t know how you did it, but it looks like it was on a counter in front of you rather than behind glass. Very impressive camera work. Not sure if it’s my computer screen or what, but the smurf isn’t looking very blue to me. I like the blue tinting on the building though….where the sun hits it. Probably not the focus of the pic, but art is subjective right? ?